List of 5 news stories. Junior Samuel Rampelt’s artwork is on display at Studio419 by Sweetwater Center for the Arts’ student art exhibition through April 18. On Tuesday, April 16, 2019, our Senior School students had a lesson on driving skills and safety thanks to KDKA-TV, in partnership with Neighborhood Ford Store, Governors Highway Safety Association, and Allegheny County Pretrial Services, who presented Taking the Lead: Ford Driving Skills for Life. Nine Senior School students competed in a mathematics competition at Indiana University of Pennsylvania (IUP) on Tuesday, April 16, 2019. The team placed second out of 28 teams with a score of 114.75. For the last seven years, Sewickley Academy has organized an exchange trip with The Perse School in Cambridge, England. Paul, a freshman, participated in the Western Pennsylvania Regional History Bee competition on March 9, 2019, at South Side Area High School. 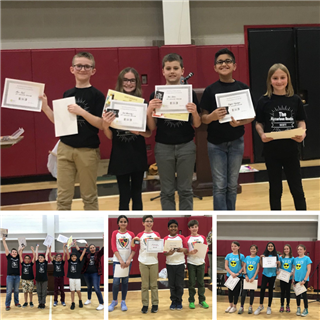 Students in Grades 4 and 5 "battled" other teams from the region on April 4-5, 2019. Students volunteered to divide reading 10 books between them and answer a variety of trivia questions during eight rounds of “battle.” On April 4, five teams of Sewickley Academy Grade 4 students “battled” with 16 teams from the region. Our teams took first, second, AND third place! Congratulations to the Book Brothers (1st), the V.F.D.’s (Very Friendly Decipherers) (2nd), and the Mysterious Readers (3rd) for their wins! Four additional teams of Sewickley Academy Grade 5 students participated in the battle on April 5, competing against a total of 14 teams. The Reading Warriors secured third place! Congratulations to our Lower School students who participated in Battle of the Books this year on remaining committed to reading widely, discussing literature, and working together! Sewickley Academy is a nationally recognized Pittsburgh private school enrolling students in Pre-K through Grade 12 on a single campus.